Back in the day when the web was in its primeval soup phase – 1999 – I went to some of the First Tuesday events. First Tuesday was and to my surprise still is a networking club for entrepreneurs, financiers and suppliers like Lawyers and Accountants to meet and, well, network. The events took place in nice venues like the Design Museum and when you arrived, you were given a colour-coded sticker/badge which marked you out as being in one of the three categories. There was a glamour associated with these events. Those were the days of cool Britannia and dot com madness like click mango raising £3m in 8 days. The events were buzzy and it was cool to be a VC (red badge I think it was) as all the sweaty entrepreneurs would make you feel like a God (or that’s how it looked). The suppliers (yellow badges) were roundly avoided if at all possible – as the last thing the entrepreneurs wanted was to be sold to and the VCs were too busy being schmoozed. In the middle of it all were the pseudo rock-star First Tuesday organisers/founders Julie Meyer and I think Andrew Carruthers from New Media Spark. The events were the place to be. 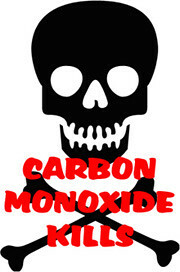 ‘carbonmonoxide kills. dot com’ he said. And that’s all he said. ‘right, ok’ said I, buying some thinking time. My thoughts were in no particular order: he really shouldn’t run to events like this, WTF?, that sounds rather niche, it’s all just some crazy dream, nutter. That’s all I remember from the conversation, but I remember him and I remember having the conversation and those are the only things I remember from those events other than the champagne atmosphere. I have told that story to a couple of people over the last 10 years and as you can imagine, I usually end it with a fascinating insight about people taking the concept of niche too far or some other really smart observation. Check it out. Fantastic. Granted it’s not the nicest looking site in the world – actually it’s probably the ugliest site I have ever seen, but it’s just bloody brilliant that it exists at all. I urge you to buy your smoke detectors from it. Kudos to you Rob – you are a legend and officially (to me) the King Of The Niches.